House, 3 Bedrooms, 2 1/2 baths (Sleeps 6) with beautiful vineyard views! Coop, our newly renovated Country Cottage is perfect for 6 guests who want to stay on beautiful 15 acre vineyard in a prime location near wineries & restaurants. Coop is just 1.5 miles from Healdsburg Plaza...3 minutes in the car or walk it in 20 minutes. Incredible location, great value and gated privacy in a newly remodeled fresh farmhouse overlooking estate vineyards. The view quite literally goes on for miles. Rates are for up to 6 people! Ru's Farm is a wedding site and we typically host weddings on Saturday's from 3pm-9pm May through November. Coop has 2 king bedrooms with organic Coyochi bedding, each with their own beautifully designed bathrooms with rain head showers. There is also a cozy third bedroom with half bath. Fully-equipped kitchen & gas grill so you can dine in. Enjoy meals on the deck and watch the sunset on the vineyards or linger in a relaxing hot tub and soak under a blanket of stars. Everything is close by so you won't spend a lot of time in the car. Healdsburg is a friendly small town without traffic jams. There are many local wineries just .5 miles away, as is the Russian River and canoe rentals to add to your adventures. Truly the wine country experience. This is a place where you can make wonderful memories with family and friends. Treat yourself! Visit our website so see more photos of our beautiful gardens, 100 year old barn, and olive garden |You've discovered a wonderful place for your next getaway to the heart of Sonoma wine country. Healdsburg is known as one of America's most charming small towns. Please note quiet hours are 10 pm to 7 am. Parking available for up to 2 vehicles. Check the availability calendar -- we update it daily! Views of estate vineyards, country but so close to Healdsburg Plaza, location in the wonderful town of Healdsburg...living the wine country style. Location is everything -- we are 1 & 1/2 miles from Healdsburg Plaza. Guests enjoy nearby golf, wineries, Healdsburg plaza, great restaurants and near perfect weather. Guests are invited to walk through the estate private vineyards. Staying in a private home with friends or family gives you privacy and togetherness that can't be found in hotels or B&Bs filled with other people. Many guests become regulars and stay here again and again.Healdsburg is a wonderful town that has a special place in the hearts of so many people. Our property is a wedding site and we typically host weddings on Saturday's from 3pm-9pm May through November. 20 acres of vineyards ON our property. Fitch mountain and rolling hillsides galore. USA Today calls Healdsburg 'America's Tuscany.' Be prepared to fall in love with our friendly wine country--Healdsburg. Yes...we have wireless in the house and out on the deck. Open kitchen & Great room with doors to the deck. Enjoy with your family and friends... Easily seats 6. Step thru the French Doors from the kitchen onto the deck to dine al fresco! Watch the grapes grow from the deck. In open kitchen & on deck: Table & six chairs ~ French Doors open to lovely 15' x 50' private deck. Some say it's the best deck in Healdsburg with a hot tub & vineyard view. Living the dream! Bluetooth sound link for your ipod, phone or ipad - enjoy your music! Walk through our beautiful gardens and private vineyards ... take photos of the vineyards at sunset...gorgeous! Private deck is 15' x 50'. Guests say the deck is amazing ~ spacious, amazing views of vineyards and private hot tub with arbor. Attractive lighting makes it magical at night. Dine on the deck! Your private hot tub is on the deck overlooking estate vineyards. What a great spot to relax after a day of wine country fun. 200 wineries within 30 minutes...many 5 minutes away. World-class restaurants 3 minutes away in downtown Healdsburg. 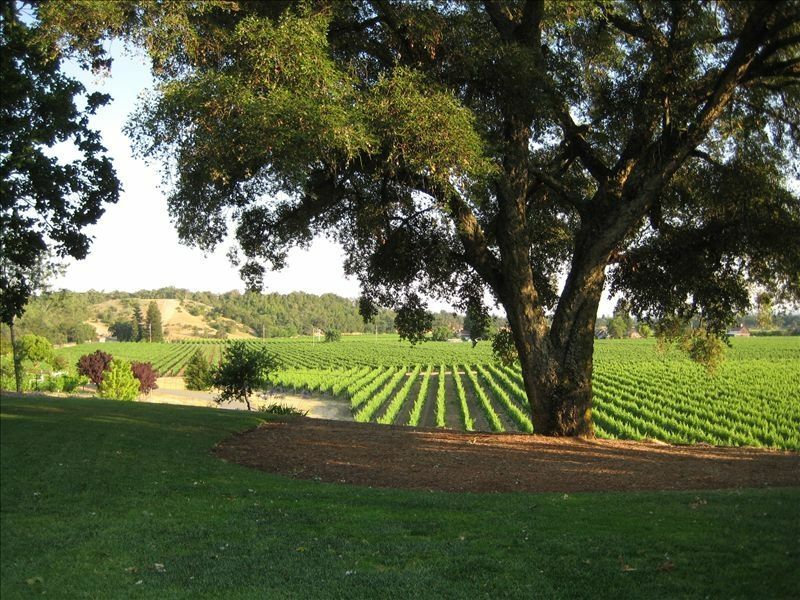 Private estate vineyards for you to explore -- take a stroll. Location is everything when you are on vacation -- we're 1 & 1/2 miles to the Plaza where you find shops, spas and world class restaurants. Instead of spending time in the car, you'll feel like a local while experiencing the wine country lifestyle. Located in the country but so close to town. A perfect light and bright oasis! Loved staying at the cottage on Ru's Farm, we used it as a home base for our wedding weekend! This property is great! Comfortable and quiet, very close to Healdsburg square. We will be back! I loved our stay. The property was beyond beautiful. Can’t wait to return! Ru’s Farm is absolutely stunning! We feel so lucky to have found this cottage for our girls weekend. The owner Leighann is extremely helpful and answers any questions/concerns almost immediately. We have never spent so much time in a rental during our trips, but the house is just so beautiful! Thank you Lele for being so easy to book with. We can’t wait for the next trip! Beautiful location and grounds. The cottage was immaculately clean and nicely decorated. Leighann was great dealing with throughout. We loved the property and had a great time. Fantastic location. Thank you for having us! Wine tasting at more than 200 wineries within 30 minutes of the property. Big fun at the Russian River--a 2 minute drive. Swim, kayak and canoe! Everything is close by--you won't spend a lot of time driving around. No traffic jams in Healdsburg.